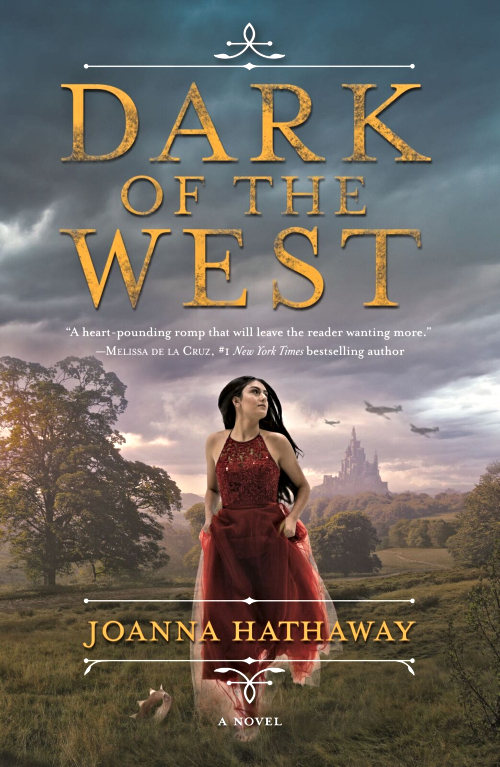 Part war drama, part romance, Dark of the West is the first novel in a stunning YA fantasy series that will appeal to readers of Sabaa Tahir, Marie Rutkoski, and Elizabeth Wein. What helps set this YA story apart is the exciting feel to its fantasy world. With DARK OF THE WEST, Hathaway creates a world that feels like a reflection of our own with one of the books strongest features being the World War II-esque flavor given to the story's setting, especially the details created to its military and technology. The story brings to vivid life flight training and air-to-air combat such as dog-fighting. I loved all the historical details incorporated, especially the fighter planes and had more than one Top Gun adrenaline filled moment during flight battle scenes! The death-defying maneuvers sequences and dangers felt real. Joanna Hathaway's debut should also appeal to readers who enjoy a strong dose of political machinations in their novels. One part military adventure and one part romance, it carefully balances the building tension of both across its pages. There are family dramas, crumbling empires, revolutionary uprisings, airplane dogfights, an assassination, revenge and a forbidden romance to root for. I adored Athan’s perspective and readers a going to swoon over his love-letters. The story is told from the dual perspectives of Athan, a fighter pilot and youngest son of General Dakar of Savient and of Princess Aurelia of Etania, whose mother stands between the general and revolution. I loved the evolving relationship between Athan and Aurelia. I think readers are going to especially fall for Athan as his viewpoint and characterization make him such a sweetheart and you just can't help but fall for him. The ending and the love letters especially broke me. I enjoyed so many facets of this debut series opener and look forward to reading more of Joanna Hathaway's Glass Alliance books. I will say that this was a slow-burn read for me with the first half a bit complicated with all the deceptions and betrayals while I was trying to familiarize myself with a new landscape—thankfully, the book will include a gorgeous map which will be much appreciated. The second half of the plot really gained momentum and was hard to put down. DARK OF THE WEST is definitely a compelling read whose author I'm excited to follow.